Consistency can be both a blessing and a burden. Take, for instance, the classic game show Family Fortunes hosted by Les Dennis. Each week, when a wildly unlikely answer was blurted out by an excitable guest, Dennis would turn to the camera and snort: “If that’s one of the answers … I’ll give you the money meself!” (Les was of sufficient means to make such a promise sound believable, as well as simply patronising). The crowd would go wild every time Dennis delivered the line. It was funny last week. It was funny this week. And, as sure as Neil Morrissey was knocking the back clean out of Les’ missus during filming hours, it would be funny the next week. Except, of course, eventually it stopped being funny. Eventually, like Morrissey himself, the audience began to tire of the repetition. “Naomi Campbell” was never going to be one of the answers for “A bird with a long neck” and Les was never going to have to put his hand in his pocket. The very consistency of the punchline that had been so soothing for so long eventually began to grate. Jamie Carragher is similarly both enriched and encumbered by the double-edged sword of consistency. Except, with Carragher, it isn’t dogged reliance on a hackneyed early evening punchline that operates as both the feather in his cap and the thorn in his side. It’s the consistency of his haste. It’s easy to forget that James Lee Duncan Carragher actually played a number of positions before eventually settling into his career-defining centre-back role. The boy from Bootle was nearly 26 by the time he found a permanent home in the middle of the back four. There are a number of styles of centre-back play and it was easy to pick out which style Carragher was. Defending the “Carragher Way” was break-neck, seat-of-the-pants stuff. Danger was never far away and Carragher was always on hand to play the hero. He was the Scouse Indiana Jones; last ditch tackles in the penalty area while being chased by an improbably large boulder. It was hair-raising stuff and it looked fantastic on the extended highlights. The natural contrast in style might be Rio Ferdinand. Ferdinand is almost never on Match of the Day because nothing much ever happens in his part of the pitch. Watching Ferdinand defend is like watching a film where the bomb is deactivated several hours before its scheduled detonation. It’s just not very good television. Carragher, on the other hand, could regularly be seen scrabbling at the wires with seconds to go before half the city was blown away. Cut the red wire, or cut the green wire? If Rio Ferdinand gave the impression of someone locked in a game of chess on the pitch, Carragher looked more like he was on Noel’s House Party playing Grab A Grand. Each blocked shot and frantic clearance providing another clip for the ex-professionals in the studio to extol Carragher’s virtues. “What Liverpool’s rivals wouldn’t give to have a last line of defence like Carragher”, they would wonder. Carragher has almost certainly never heard of the Superior Pilot Syndrome. A superior pilot uses his superior judgment to avoid situations that would require the use of his superior skills. Whereas players like Ferdinand, Ricardo Carvalho and Vincent Kompany use vision and pre-emptive strategies to snuff out threats at source, it is entirely possible that Carragher views foresight as a kind of gamesmanship. Not out and out cheating perhaps, but certainly not something we want to see in the English game. Plus it’s harder to rally the crowd with a careful interception forty yards from goal. But haste isn’t just a style of play for Carragher. It’s an ethos. A way of life, even. Carragher’s single biggest fear might be failing to strike while the iron is hot. A fan throws a coin at you during a game? Hurl the coin back into the crowd with force. A radio show host calls you a “bottler” for contemplating international retirement at the tender age of 29? Ring the guy up and have it out with him on air. Carragher’s characteristic speed of thought and decisive response provided concern for us all. The entire nation had expressed a certain mirthy surprise at Carragher’s call-up. Would he engage all 53 million of us in a small-sided training game and clatter the lot of us? Where would he get all the bibs? Perhaps he would outsource the hit to his mates, as he had bragged about doing in a tale of retribution against Lucas Neill in his autobiography (Neill had broken Carragher’s leg during an ugly encounter in 2003). Punditry was supposed to be a new chapter in Carragher’s life. Being a player was just the opening act – an “amuse-bouche” that would be bettered by studio analysis, coaching, management. Director of Football, even? Nothing was impossible. What’s more, the microphone would provide the world with an opportunity to see a more considered and thoughtful side to Jamie’s personality. Parachuted straight into the prime slot on Sky Sports, too. It was all teed up for him. If they thought Gary Neville was good, wait until they got a bit of 23 Carra-gold. He’d be Andy Gray without the sexism. Carragher sat down in his chair on Day 1 like he was king of the playground. There was a sense of unearned entitlement in his posture that screamed “I’m the man here, now. And if you think I’m not having the last word in at least three out of every five conversations, you’ve got another thing coming”. Alas, in the studio, as on the pitch before it, Carragher still retained the demeanour of a fireman rushing off to the wrong fire. Despite having exchanged boots for brogues, Carragher would still flail his arms around and gesticulate excitedly, as though participating in an enthusiastic game of Pictionary. Nobody doubted the man’s exuberance, but it was all very apparently off the cuff. One of his earliest oratorical gambits was to dismiss Papisse Cisse’s religious beliefs live on air as “all that crap over the summer”. Words you have to assume he hadn’t crafted carefully in advance. Later into the season he claimed he expected Manchester City to pick up 30 points from the next six games. By the time he had broken out a wildly confused analogy comparing diving to how you would react to being punched in front of your wife, it was like Jamie was back on the field of play once more, last ditch tackling the ball into his own net. 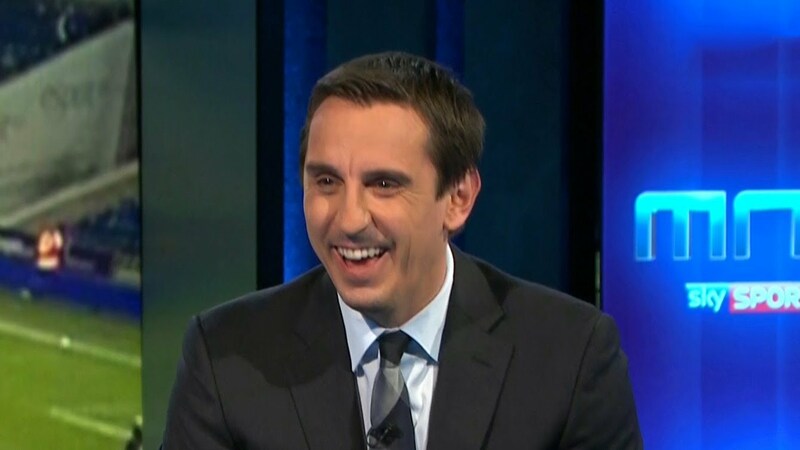 Maybe Carragher didn’t realise that Neville the Pundit had actually been doing what Neville the Player had also been doing for an entire career. Research. Planning. The sort of hard miles that gets you 85 England caps and eight league titles. If it looked easy, it was because Neville was still putting in all the same effort and endeavour that he had used to compensate for his fairly limited footballing ability. Except now he was the one with the talent. Neville had a natural flair for talking about football. Couple this with the work ethic and diligence that had helped him keep up with Giggs, Scholes and Beckham on the field of play, and it made for excellent punditry off it. Jamie Carragher is still a relatively young man. He can take comfort from the fact that the wisdom accrued from advancing years often begets patience. This is just as well, as a career in management inevitably beckons for the whole-hearted Liverpudlian. And a spell in the technical area is going to be a sobering experience for Jamie unless he acquires a little forbearance. He must learn to think before he speaks, or it’ll be death by a thousand cuts from dressing room bust-ups, touchline bans and lost mind games. Perhaps the cure is to teach Carragher self-restraint as you would a four year old. Put a sweet in front of him and tell him, if he can leave it alone for five minutes, he can have the whole bag. Or challenge him to go second in the analysis for every question of an entire episode of Monday Night Football. One way or another, he needs to learn to stop barging down doors instead of using the bloody handle. Carragher’s career is moving ever more towards situations where thought is required before action. If he can’t make the necessary changes in mindset, he’s very quickly going to find out that those who fail to prepare must, inevitably, prepare to fail. Neville refused to be overawed by his new rival.